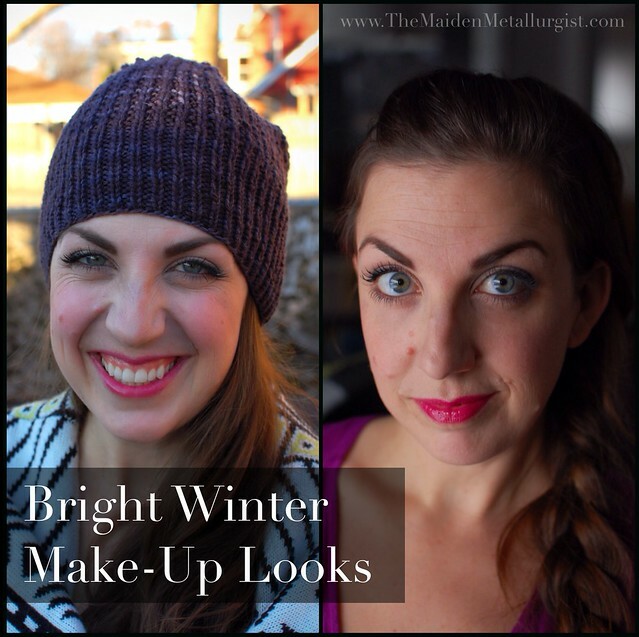 Let’s have a frivolous chat about make-up okay? 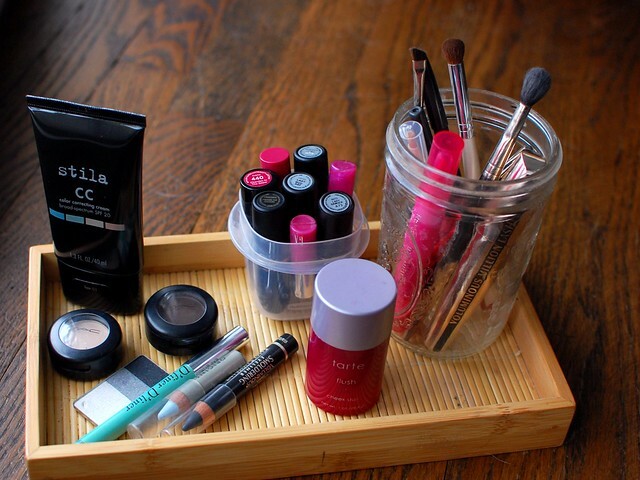 Last summer I found this “Mom make up” routine on Maskcara and I completely changed how I was doing my make up. It felt great to have a little direction and learn about some of these make-up artist techniques. I felt really good, and it was a quick way to get pretty when I was feeling exhausted and postpartum and not so pretty. BUT THEN… A friend turned me on to seasonal color analysis, and even though I’m self diagnosed (though I would love to be draped one day) I feel really comfortable in the Bright winter palette. I feel bright, and rested and alive. It took a little getting used to the idea, but now it feels right. I was missing my contouring though. One thing I’m a little self conscious about is my nose, especially after having kids, pregnancy made my nose wider (I swear!) and I kind of hate it. You know I’m all for self love and body acceptance… but if a little thing like contouring can make me feel great about my nose I’m all for that too. 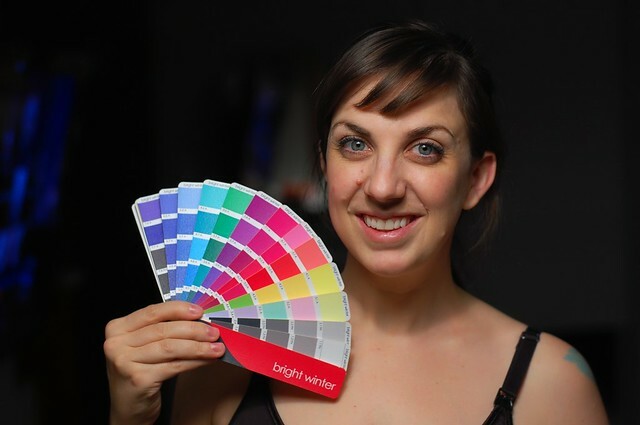 The problem is, there is no brown in the BW palette. And now that I notice these things, I notice how muddy and dull I look in brown. It ages me, and I’m not into that. So for me, no contouring. If I was any other season and I could pull off brown, I’d probably keep doing it. I’m really being strict about fan matching new purchases, if it’s not right, it’s out the door! 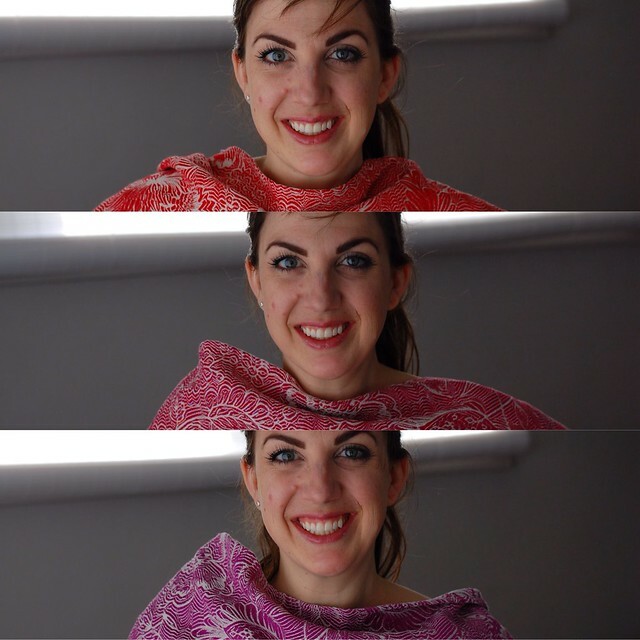 These Pavo wraps are all surprising matches, and they are so bright and fun. And I swatched EVERY piece of the Peter Pilotto for Target collection, and this print was the only match, but it’s so good! And I’m looking forward to getting geeky with my closet this weekend! I’m embracing the palette, and it’s being good to me. After years of draping myself in drab neutrals it’s tough making the shift to bright colors. Ocasionally doubt creeps in, when that happens, I take a look at the palette working for me like this, and I harden my resolve. 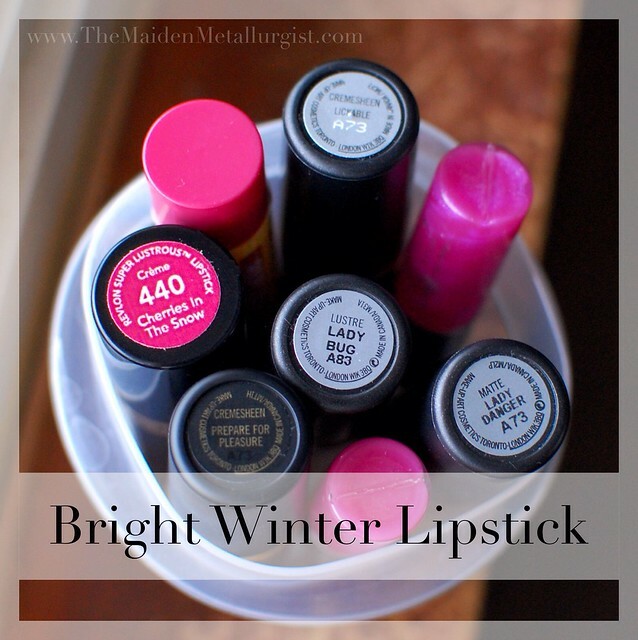 Bright winter is… well it’s bright, its bold, it’s a change. I’ve had to abandon my make up routine (yes, the one that changed my life last year) and find a new way to make these colors work for me. 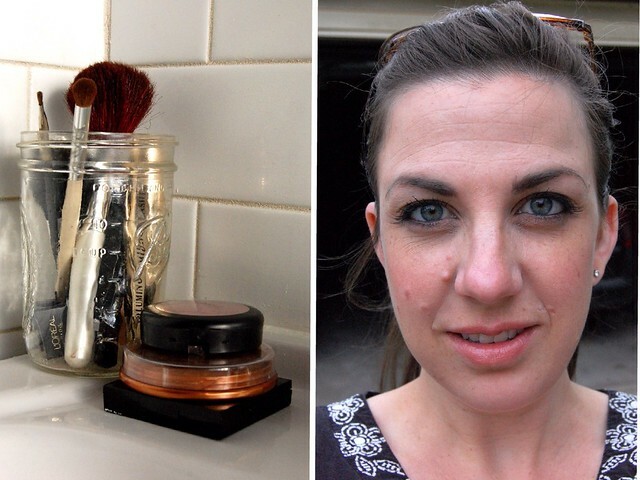 So, so long bronzer! The first thing to go was black eyeliner. Yes, it’s true. And let me tell you, black eyeliner and I go way back. But I can’t deny that switching to a grey liner brightens my eyes and opens them up, you can really see my clear eye color and long lashes. The next thing to go- brown. Brown everything. There is no brown in the BW palette. This one… a little tougher for me. I’m not sure where to go with my eyebrow fill. But eliminating the coutour, bronzer, and brown eyeshadow also eliminated the “muddiness” that I couldn’t quite put my finger on before. For me, making the switch to bright colors is all about keeping it sheer. Too much is too much, but a bright lip CAN make a BW’s eyes pop even more than clear eyes already do on their own. I’m a cool, fair olive. VERY fair, almost translucent. I have a heck of a time finding a tinted moisturizer that doesn’t look too yellow/peach/brown. I’m trying out Stilla CC Cream in fair 01 right now, but I might stick with plain moisturizer. I don’t wear foundation because I don’t like how it feels on my face, but this CC cream WITH SUNSCREEN doesn’t feel heavy or suffocating. I use Maybelline Dream Lumi in Ivory as both concealer and highlighter. This stuff is gold, and it’s a total cheat for highlighters that sell for 4x the price. Most blush I’m finding has too much brown in the pink, but this Tarte Stain in Flush is perfect, and I love a cream or gel blush, it feels so much better on my skin than powder. Eyeliner is grey or granite. Right now I’m using both L’oreal Smouldering Grey and Maybelline Unstoppable Pewter I reached for the Loreal first because I ADORE the black voluminous liner, but the grey just isn’t the same, it doesn’t glide on as easily or as smoothly. The Maybelline is lighter and glides on easily. I love Origins Eye Brightener and I’ve used it for years when I wasn’t wearing black liner. Eyeshadow is MAC Shroom or the Black Tulip eyeshadow trio from Aveda. I have very heavy lids and can not wear much color without looking heavily made up. I don’t like a lot of color on my lids, because I don’t want my eyes to have any competition. Mascara is L’oreal Voluminous Millions in Black and it’s a good go to that I know I like. I think when it comes to mascara freshness is more important than a luxury price tag. A new drugstore mascara will give better results than a 3 month old luxury brand every time. You know I can’t get by with out my fill, so even though brown is not in my palette I’m still using MAC Brun and I think it might take an act of God to make me give it up. Gotta work the brows! If Lipstick is not for you don’t wear it, but if you do wear it it’s an easy way to have a little fun and mix up your make up look without changing the rest of your face. Below is a list of fun Bright Winter Colors that look good on me. There are lots of other colors that I’m not crazy about, so I don’t wear them. MAC- Lady Danger, Lady Bug, Prepare for Pleasure (looks best when paired with MAC Cherry lip pencil), and Lickable. Burt’s Bees Replenishing Lip Balm doesn’t have any color, I just like to put it on and then wipe it off before putting on lipstick. Use what ever gloss you like. I love these little glosses I got from GAP for Christmas one year. They are almost out and I’m super sad about it. They are very sheer color when I want a more low key look. And if you’re going to wear bright, bold lip color I adore Benefit D’finer D’liner a clear wax liner that keep bright lip color from creeping and spreading up fine lines around the mouth, and on the lips where it belongs.